Watch videos of credit unions, industry organizations and vendors join in the viral fundraising trend. 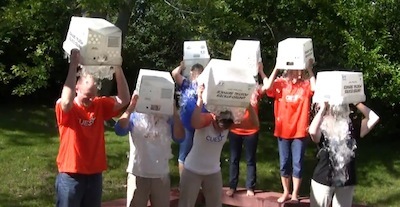 What started with a simple challenge by CUES and the $582 million CitizensFirst Credit Union has spurred others across the credit union industry to get soaked for a good cause. Credit unions and their vendors have joined the national ALS Ice Bucket Challenge, pouring a bucket of ice water over their heads to raise money for charities that support victims of amyotrophic lateral sclerosis, also known as Lou Gehrig’s Disease. ALS attacks nerve cells, ultimately leading to paralysis. Countless celebrities and everyday people have participated in the trend.